HETS Board Members during meeting at BCC. The strategic plan framework corresponding to years 2017-2020 is an extension of previous one, and its focused on core areas of access, retention and successful completion, and online learning / technology integration. Among the news shared with the Board were highlighted the major activities to support the organizational programmatic goals such as: tailored workshop offerings either online and new ones face to face; additional tools and services added to the HETS Virtual Plaza and HETS Website. Also, the results of our main events the HETS Best Practices Showcase, Student Leadership Showcases in PR and NY were presented, in which Student Ambassadors program participants shared with their peers the tools and resources free of charge available for them at the Student Placita of the HETS Virtual Plaza. Board members also welcomed representatives from new members such as Northeast Lakeview College, Oklahoma City Community College, and University at Albany. During the second day of meeting the Board held a corporate session with current HETS partners like Educational Testing Services, and also welcomed EmblemHealth, and Interstaff, Inc. as new partners. Event Moderator, Dr. Carlos Morales, TCC Connect Campus President. Dr. Aubra Gantt (Tarrant County College) during the Distance Learning Event at BCC (July 13,2018). 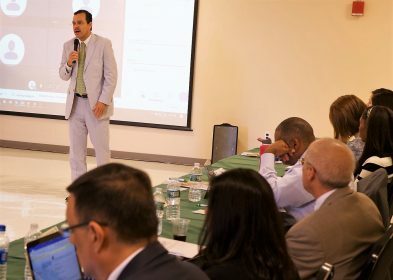 College, Bronx Community College, California State University San Marcos, and Southeast Missouri State University, actively participated on the discussion held regarding the online learning survey data and examples shared to Board Members during this event. Soon, the video with the highlights of the discussion will be available to watch on our YouTube channel. Executive Committee and meeting host during HETS 25th Anniversary luncheon. Board Members closed the meeting with the 25th Anniversary celebration. As part of the celebration events; President Thomas Isekenegbe, and Vice President Irene R. Delgado from Bronx Community College; took invitees to a brief tour of the campus, which is the first community college to hold the honor of being one of the national sites newly designated as a National Historic Landmark. During the tour, guests and attendees visited the Gould Memorial Library, the Hall of Fame of Greatest Americans, and the outstanding new library facilities on North Hall. After that, Board Members, and, special guests’ attendees enjoyed the official luncheon where a video was shared to celebrate the first 25 Years of HETS history (access the link here). Dr. Carlos Vargas-Aburto, HETS Chair and President of Southeast Missouri State University; Dr. Antonio Pérez, President of Borough of Manhattan Community College, and Ms. Yubelkys Montalvo, HETS Executive Director presented the ceremony speeches’ before cutting the celebration cake. 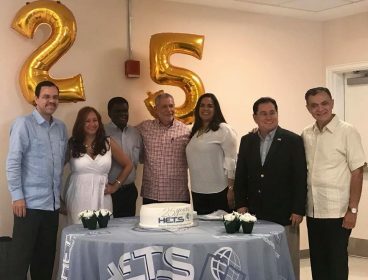 HETS 25th Anniversary celebrations will extend during next academic year until the Winter Board Meeting in Puerto Rico on February 2019. HETS would like to extend its special thanks to President Thomas Isekenegbe; Dr. Irene R. Delgado, Vice President for Student Success, and all their staff at BCC for hosting these events at their facilities. For more information about HETS services, please visit www.hets.org, contact us via email info@hets.org or just call us at (787) 250-1912 exts. 2372/ 2373.